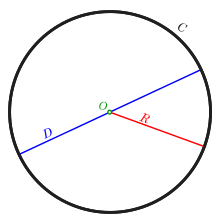 Circumference (C in black) of a circle with diameter (D in cyan), radius (R in red), and centre (O in magenta). Circumference = π × diameter = 2 × π × radius. In geometry, the circumference (from Latin circumferens, meaning "carrying around") of a circle is the (linear) distance around it. That is, the circumference would be the length of the circle if it were opened up and straightened out to a line segment. Since a circle is the edge (boundary) of a disk, circumference is a special case of perimeter. The perimeter is the length around any closed figure and is the term used for most figures excepting the circle and some circular-like figures such as ellipses. Informally, "circumference" may also refer to the edge itself rather than to the length of the edge. The circumference of a circle is the distance around it, but if, as in many elementary treatments, distance is defined in terms of straight lines, this can not be used as a definition. Under these circumstances, the circumference of a circle may be defined as the limit of the perimeters of inscribed regular polygons as the number of sides increases without bound. The term circumference is used when measuring physical objects, as well as when considering abstract geometric forms. When a circle's diameter is 1, its circumference is π. When a circle's radius is 1—called a unit circle—its circumference is 2π. The use of the mathematical constant π is ubiquitous in mathematics, engineering, and science. In Measurement of a Circle written circa 250 BCE, Archimedes showed that this ratio (C/d, since he did not use the name π) was greater than 310/71 but less than 31/7 by calculating the perimeters of an inscribed and a circumscribed regular polygon of 96 sides. This method for approximating π was used for centuries, obtaining more accuracy by using polygons of larger and larger number of sides. The last such calculation was performed in 1630 by Christoph Grienberger who used polygons with 1040 sides. is the perimeter of an inscribed rhombus with vertices at the endpoints of the major and minor axes. In graph theory the circumference of a graph refers to the longest (simple) cycle contained in that graph. ^ San Diego State University (2004). "Perimeter, Area and Circumference" (PDF). Addison-Wesley. Archived from the original (PDF) on 6 October 2014. ^ Sloane, N. J. A. (ed.). "Sequence A000796". The On-Line Encyclopedia of Integer Sequences. OEIS Foundation. ^ Jameson, G.J.O. (2014). "Inequalities for the perimeter of an ellipse". Mathematical Gazette. 98: 227–234. doi:10.2307/3621497. Look up circumference in Wiktionary, the free dictionary.